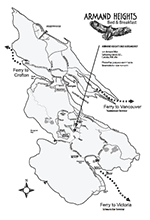 Salt Spring Island is accessible by ferry (car/passenger), float plane, or by boat. The Armand Heights Bed & Breakfast is located near the center of the island up Dukes road, off of Fulford-Ganges Road (look for our sign). 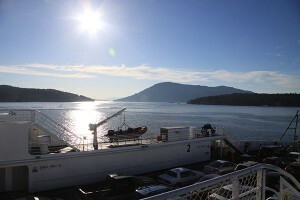 BC Ferries offer a number of regular services to Salt Spring Island. Consult the BC Ferries website for schedules and rates. Via Tsawwassen Ferry terminal to Long Harbour, Salt Spring Island. Direct 1.5 hrs, stopping 2.5hrs. From Tsawwassen Ferry terminal to Fulford Harbour, Salt Spring Island. 2.5hrs, with a change of ferry at Swartz Bay. From Horseshoe Bay Ferry terminal to Vesuvius, Salt Spring Island. From Swartz Bay Ferry terminal (close to Victoria), to Fulford Harbour, Salt Spring Island. Direct 35mins. From Crofton Ferry terminal (between Duncan and Chemainus) to Vesuvius, Salt Spring Island. Direct 20mins. Sails to Victoria from Port Angeles. From Anacortes, U.S.A. and the San Juan Islands to Sidney, north of Victoria near Swartz Bay ferry terminal. A number of regular services directly from Vancouver Harbour or Vancouver airport to Ganges on Salt Spring Island. Direct 15-20min flight.